If you don’t think of chemistry as an exciting enough topic for a movie, you probably don’t know much about the life and work of Leo Baekeland, the Belgium-born scientist who produced Bakelite — the very first thermoset plastic — and in the process changed the world. 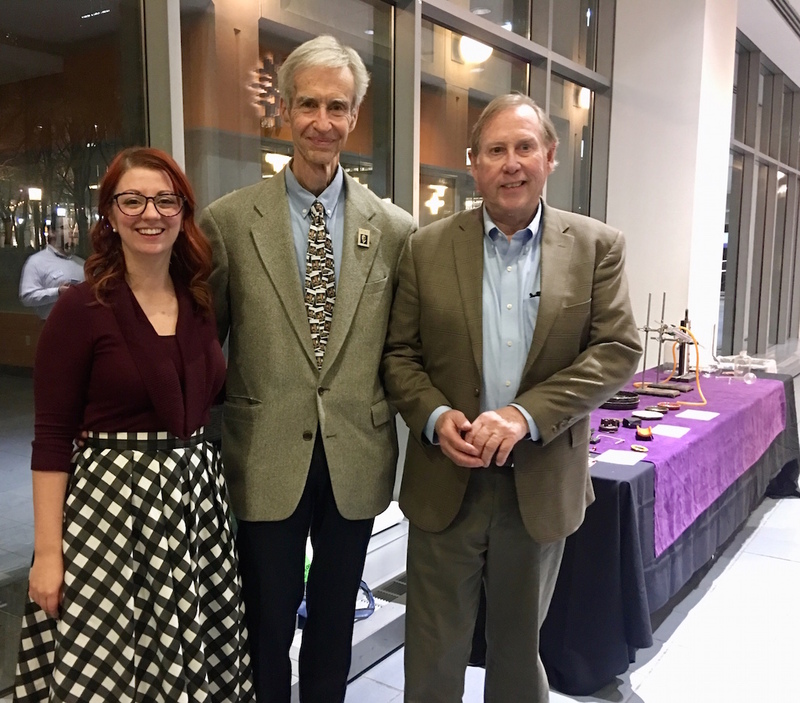 On November 29, the NYU Tandon community was treated to a showing of All Things Bakelite: The Age of Plastics, directed by filmmaker John Maher and executive-produced by Baekeland’s great-grandson, Hugh Karraker. As a bonus, the two were on hand (along with chemist Louis Pilato) to field questions about the iconoclastic scientist; the revolutionary substance he created; and the process of filming a picture that would engage and entertain as it enlightened. As the movie — which included historic reenactments, rare archival footage, interviews, and (surprisingly) humorous musical interludes — explained, Baekeland had his first scientific success when he invented Velox, the first photographic printing paper that could be developed in artificial light. He sold the invention to George Eastman (of Eastman-Kodak fame) in 1899, for a sum that would be equivalent to tens of millions of dollars today. Not content to rest on his laurels, however, he continued to innovate, and in 1907, while trying to find a sturdy, heat-resistant substitute for shellac, Baekeland produced a synthetic substance he called Bakelite. Soft enough initially to be molded into any shape (and then exceptionally durable as a thermosetting material by using specific degrees of heat and pressure), Bakelite turned out to be quick, easy, and inexpensive to work with, and soon manufacturers were using it to make radio casings, car parts, jewelry, and a plethora of other consumer goods. Bakelite artifacts and family heirlooms were on display for attendees to explore. The invention of Bakelite ushered in the era of modern plastics, and Karraker acknowledged that some viewers might not consider that a good thing, given the environmental concerns that have arisen in more recent decades. "We’re soiling the material’s reputation with our overconsumption and our neglect of its afterlife," he explained. "But as you hear from one of the research chemists we interviewed on-camera for the film, it isn’t the failings of plastic that got us into our current situation; it’s our own human failings. Plastic is, at the same time, both the finest and the worst expression of mankind’s capabilities." Brittney Anne Bahlman, Tandon’s Director of Student Affairs and Student Activities, who arranged the event, agreed that the story of Bakelite was an inspiring one. "In the film, a research chemist says that Leo Baekeland leaned against a wall experienced by earlier chemists and ended up discovering a doorway no one had ever found before," she said. “That’s exactly what we wish for our students today."